(Bloomberg) – Brazil’s President Jair Bolsonaro pledged swift and sweeping measures to fix the economy and prevent Latin America’s largest nation from turning into a Venezuela-style regime. Plans to sell a large number of state-owned companies are nearly ready, and a proposal to be sent to Congress will bring “substantial” cuts to pension outlays and establish a minimum retirement age, Bolsonaro said on Wednesday in Davos in an interview with Bloomberg News Editor-in-Chief John Micklethwait. He said the approval of the pension reform investors are eagerly awaiting is practically certain as Brazil’s financial situation gives it little choice. 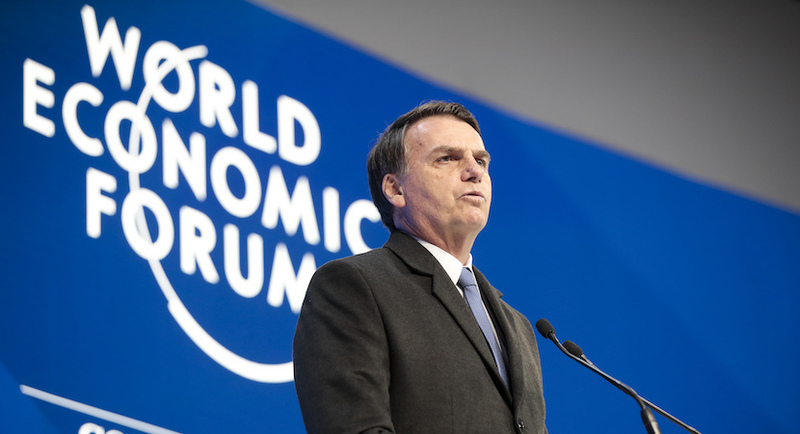 With global investors excited by the prospect of a market-friendly Brazil, the new president addressed a packed conference hall on Tuesday, promising to cut taxes and slash red tape in a brief speech. While Brazil’s potential raised interest in the sale of state assets and the possibility of greater trade remains intense, investors are starting to demand more specifics from the new administration. Following a 20% rally since Bolsonaro’s first round victory, Sao Paulo stock market gains have taken a pause. Some of the privatisation plans have begun to emerge in recent days but a pension reform proposal will only be presented to Congress in mid-February, and it may take many more months to pass. Markets are eyeing the pension reform closely because of its potential to help narrow a gaping budget deficit. Bolsonaro said efforts were under way to modernise the South American trade block Mercosur and allow Brazil to seek separate trade deals. “A country the size of Brazil can’t be held back by Mercosur to do trade with the rest of the world,” said Bolsonaro, a 63 year-old former paratrooper. An impasse on trade talks with the European Union was due to France’s resistance to Brazilian demands on farm goods, he said. In the wake of the worst recession on record and years of corruption scandals, Bolsonaro’s tough campaign talk on law and order as well as his promise of a clean government had resonated with a population deeply disillusioned with traditional parties. However, his first trip overseas as president has been overshadowed somewhat by Brazilian media reports on allegations of financial irregularities involving his oldest son. The inquiry into Flavio Bolsonaro, a Senator-elect, risks undermining the president’s anti-corruption agenda and alienating his support base. “If by chance he erred and it were proven, I regret it as a father, but he’ll have to pay the price for those actions we can’t accept,” Bolsonaro said.